Thank you for my plants. Arrived in excellent condition and the size ordered. Also has very excellent roots. Mail order was scary. I received my burning bush plants and they are beautiful. Thank You Tn Nursery. I will be a long standing customer. I used these hedges around my pool. They are nice in the fall. What Vibrance, Love My Shrub! Burning bush is one of my favorite shrubs. Mine is a perfect border and comes alive with vibrance in Autumn. Wanted to give you some feedback on my bush. It's firey red and all my neighbors are wondering where i got this at. I told them. my burning bush got vibrant this fall. It's gorgeous too in the summer. I am making a hedge from it. Thanks Tn ! Love your plants. love this bush. it's vibrant as it was the day i got it. The Euonymus alatus, also known as the Burning Bush Shrub, is sure to bring beauty and depth in color to your properties. This plant is native to central and northern countries in Japan, Korea, and China, and is remembered by many by its distinctive deep red color. The leaves are a half inch to two and a half inches long as well as width. Throughout a relatively long period in the springs, these shrubs bloom elegant flowers with a green hue to them. This ornamental plant has been awarded the Royal Horticultural Society's Award of Garden Merit and is simply stunning. Neem oil is recommended in soil supplements, and these plants grow very slow, averaging at about five feet per every fifteen years of growth. Burning Bush Shrub - Euonymus alatus is a deciduous bush with a strong nature; it shows, splendid red shading each Autumn. A prominent determination for scenes, this bush is delightful all year, and elements dull green leaves when not sprouting. 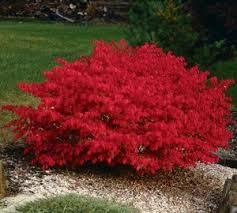 The Burning Bush is extremely solid, not at all like numerous support plants and brambles. It doesn't oblige energetic pruning. The Burning Bush is a beautiful plant that looks like it's on fire. Bright red leaves adorn the branches of the bush that often blooms in the fall season, blending with the orange, red and yellow leaves that are on the trees. The bush is commonly used to create natural hedges and divisions in yards or planted along sidewalks and pathways. Most shrubs range from five to eight feet in height while some can grow to about 12 to 15 feet in environments that have moist soils. During the spring season, the burning bush features green leaves with small white flowers on the ends. These little flowers will grow to the vibrant red and orange fruit and leaves that are seen in the bush. Bushes that grow in areas that don't see as much moisture or sunlight will have leaves a lighter shade or red and sometimes pink. It is easy to grow the bush as it only takes fertile soil, sunshine, and moisture for it to thrive.